Weight – Approx. 11,000 lbs. 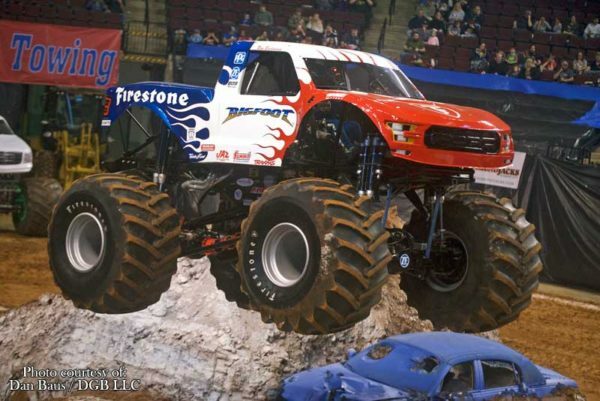 The Firestone BIGFOOT was completed in December of 2011, and represents a departure from the BIGFOOT technology of the past. This truck utilizes a low center of gravity chassis, long-travel shocks, and a longer wheelbase than the earlier BIGFOOT trucks. Needing a wild look to match its aggressive stance, it became the first monster truck to don a desert trophy truck body. In its first race season (2012), with legendary driver Dan Runte, it won the Toughest Monster Truck (TMT) Tour Championship. In September of that year, Dan and BIGFOOT retook the Guinness World Record for a monster truck long jump, soaring over 214 ft. in Indianapolis, IN. To finish off a great rookie year for the truck, it traveled to Aruba for a series of shows with the Speed Energy BIGFOOT. To follow all that up, they won the TMT series again in 2013 and in 2014. In 2018, Christian Norman took over the driver’s seat and won the 2018 4WD Jamboree Points Series.